Alternative Therapies in Health and Medicine, 2015. 21 Suppl 1:52-62. During the past 50 years, the amount of synthetic dye used in foods has increased by 500%. At the same time, there has been an alarming rise in behavioral problems such as aggression, attention deficit disorder (ADD), and attention-deficit/hyperactivity disorder (ADHD). The molecules of synthetic colorants are small, and the immune system finds it difficult to defend the body against them. SHULA’S NOTE: It’s not just behavior that can be affected by food dyes. They can ruin your health in a whole lot of ways. 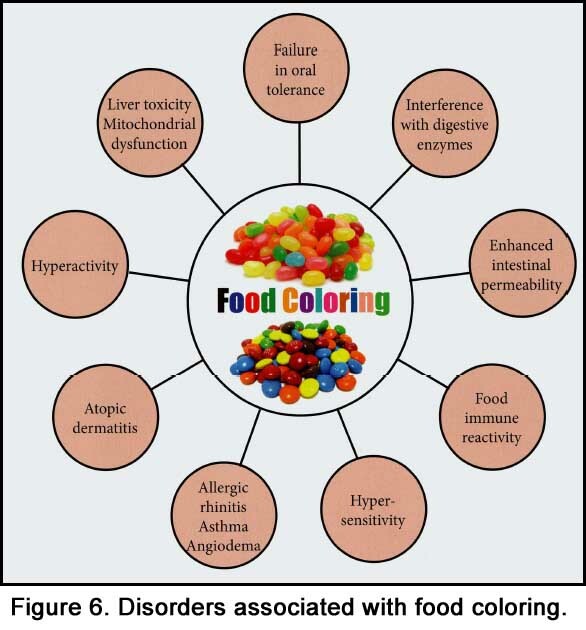 This entry was posted in 2011-2015, ADHD, Aggression, Food Dyes, Hyperactivity, Immune System, Review, Editorial or Speech. Bookmark the permalink. I hear you, Peter. If you need help finding foods without those additives, the Feingold Association provides Foodlists, Fast Food Lists, and other guidance. It may be worthwhile to check them out at http://www.feingold.org (don’t use your phone … their website is not really formatted for phones and it will be frustrating — use a real computer to look around on there.